Resampling helps students understand the meaning of sampling distributions, sampling variability, P-values, hypothesis tests, and confidence intervals. This groundbreaking book shows how to apply modern resampling techniques to mathematical statistics. Extensively class-tested to ensure an accessible presentation, Mathematical Statistics with Resampling and R utilizes the powerful and flexible computer language R to underscore the significance and benefits of modern resampling techniques. Throughout the book, case studies on diverse subjects such as flight delays, birth weights of babies, and telephone company repair times illustrate the relevance of the real-world applications of the discussed material. Key definitions and theorems of important probability distributions are collected at the end of the book, and a related website is also available, featuring additional material including data sets, R scripts, and helpful teaching hints. 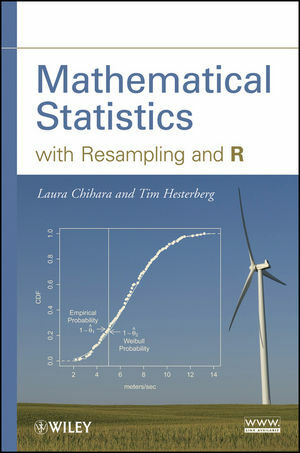 Mathematical Statistics with Resampling and R is an excellent book for courses on mathematical statistics at the upper-undergraduate and graduate levels. It also serves as a valuable reference for applied statisticians working in the areas of business, economics, biostatistics, and public health who utilize resampling methods in their everyday work. LAURA CHIHARA, PhD, is Professor of Mathematics at Carleton College. She has extensive experience teaching mathematical statistics and applied regression analysis. She has supervised undergraduates working on statistics projects for local businesses and organizations such as Target Corporation and the Minnesota Pollution Control Agency. Dr. Chihara has experience with S+ and R from her work at Insightful Corporation (formerly MathSoft) and in statistical consulting. TIM HESTERBERG, PhD, is Senior Ads Quality Statistician at Google. He was a senior research scientist for Insightful Corporation and led the development of S+Resample and other S+ and R software. Dr. Hesterberg has published numerous articles in the areas of bootstrap and related resampling techniques, Monte Carlo simulation methodology, modern regression, tectonic deformation estimation, and electric demand forecasting.